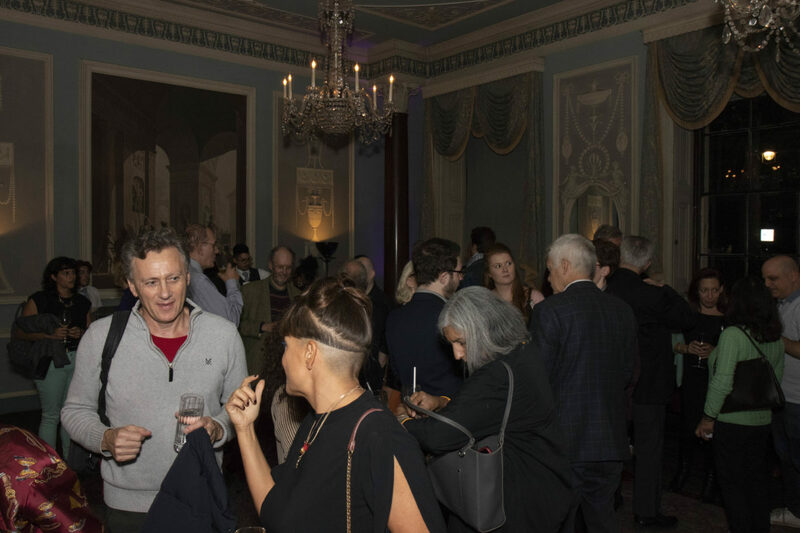 The illustrious surroundings of Portman Square’s Home House played host to Byte The Book’s September event, which asked the timely question “How Much Is Your Writing Worth?”. 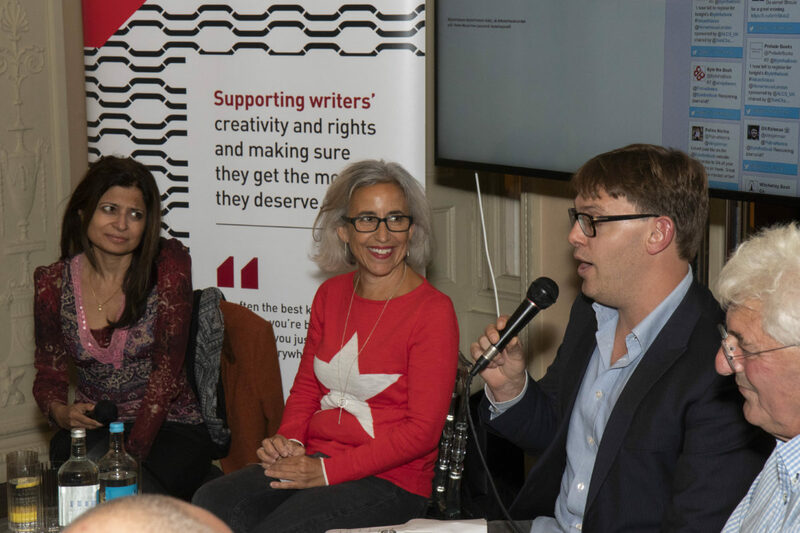 Broadcaster and author Tom Chatfield chaired, bringing together a three-strong panel featuring publisher Richard Charkin, indie author Laxmi Hariharan and traditionally published author Tammy Cohen. 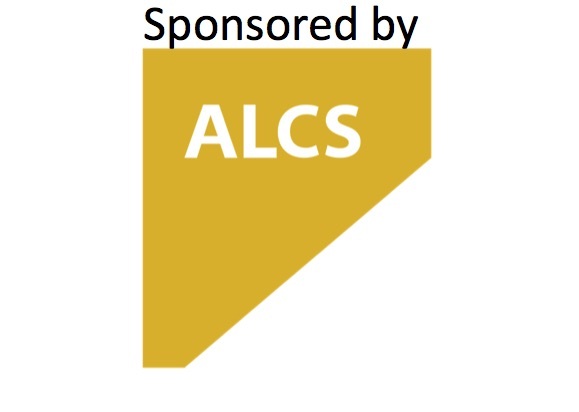 We were very grateful to ALCS for sponsoring this event. 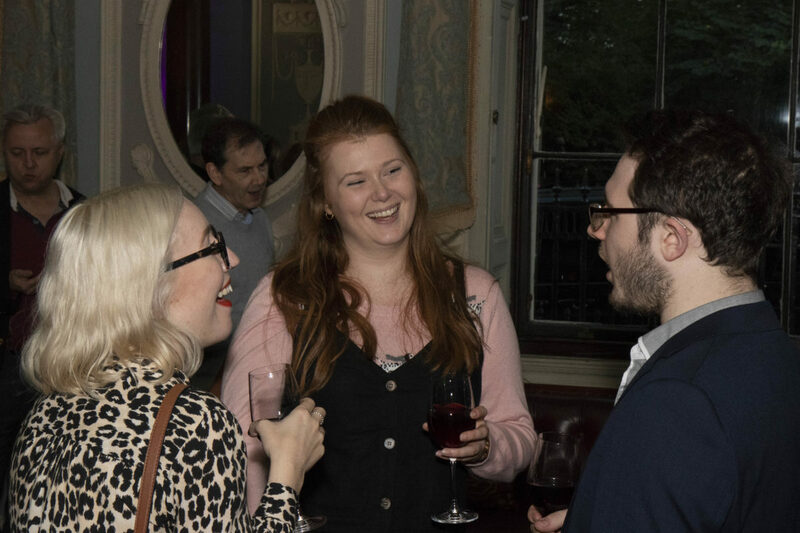 Here we see from left to right Alice Donovan and Esther Jones from ALCS talking to Rhodri Hughes from the CLA. 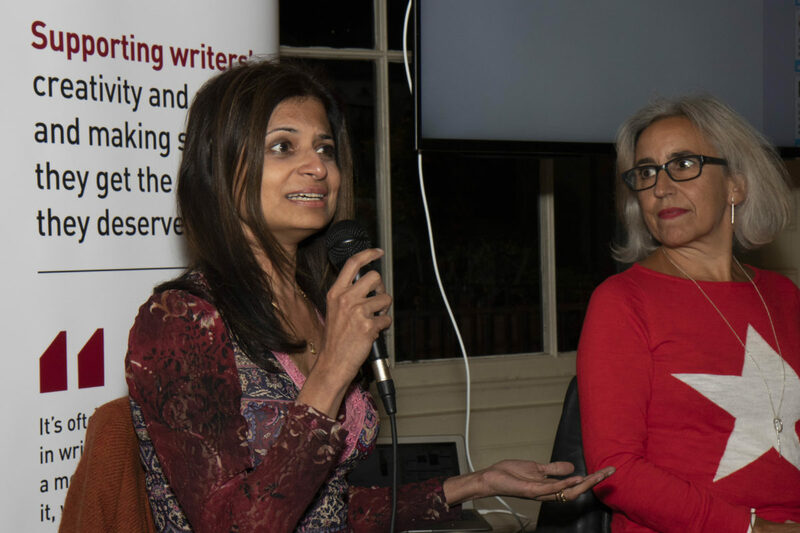 Surveys suggest, began Tom, that the average annual earnings of published authors is currently around £10,000, representing a ten-year decline of almost 50%. Richard blamed the destruction of the public library system for this decline, pointing out that, once upon a time, around 2,500 copies of an author’s book would go straight to the libraries. It’s extremely difficult for writers to replace those sales in today’s saturated marketplace, meaning they automatically begin on the back foot. 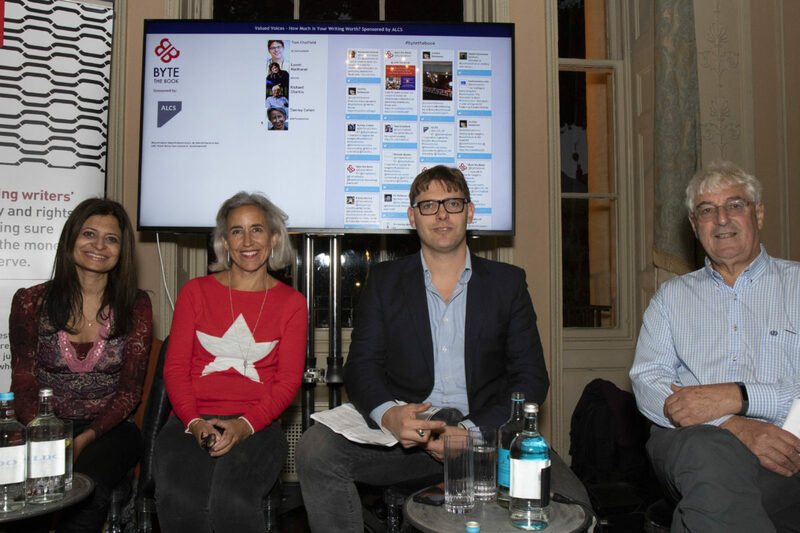 Our brilliant panel from left to right: Laxmi Hariharan, Tammy Cohen, Tom Chatfield (chair) and Richard Charkin. So what should or could writers be doing to augment or support their incomes? “There are infinite ways to be an author now,” said Tammy, “so you have to find what fits your path”. Traditionally published authors, she continued, were once free to be just that - authors - but in 2018, they have to be “a business” as well, taking active responsibility for marketing their content. Beyond that, she advised registering for royalty collection societies such as the ALCS and PLR, finding multiple ways to monetise your writing (editorial services, writing reviews and features, securing grants), using pseudonyms to write across multiple genres and, most importantly, “not giving up the day job”. Laxmi Hariharan, whose independently published books have made her a New York Times bestseller, responded by asking “Why should I ‘supplement my income’ with other things? I’m a novelist, and I want to make all my money from writing books”. 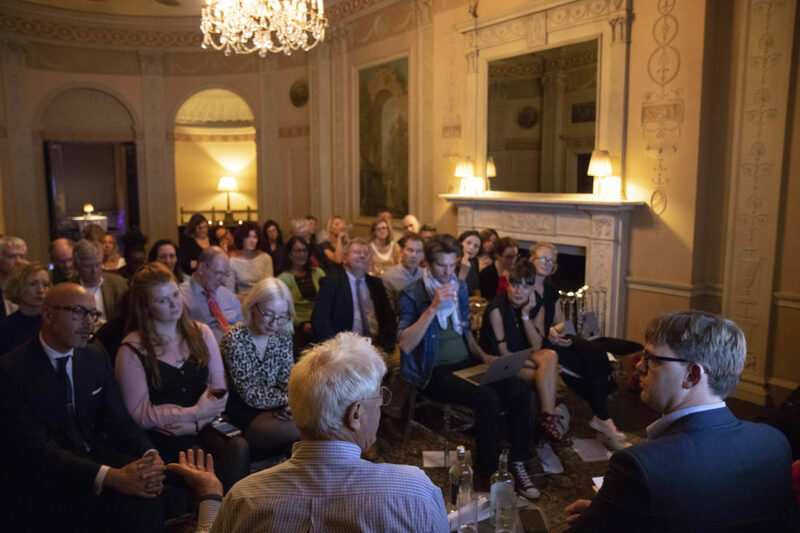 Her advice to the authors in the room was, essentially, to knuckle down and get their hands dirty. “Write lots of stories and put them out fast, because you need to be current in the online world. Then, once your digital assets are out there, market them well”. 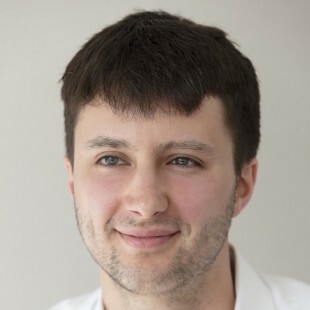 Returning attention to publishing’s old guard, Tom asked the panel for examples of things that traditional publishers do well, and things they do badly. Richard admitted that publishers are “fairly useless”, and are often guilty of “faffing around”. Tammy, meanwhile, complained of a lack of transparency in the author-publisher relationship. “Most writers wish their publishers were more honest with them about how many of their books they expect to sell, or how much they’ll spend on marketing. And all the waiting… the pace in the industry is glacial”. Laxmi, on the other hand, who was traditionally published before going independent, praised the editorial expertise of the mainstream players. 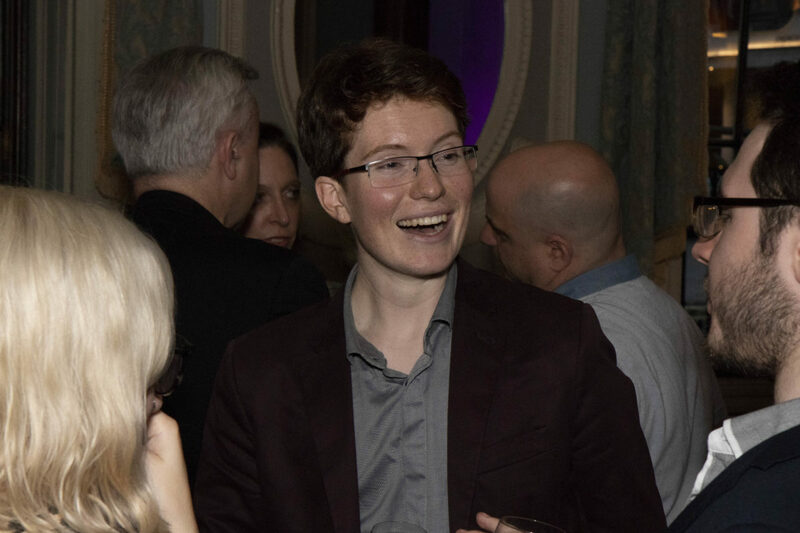 “I struggled with the fact that I knew more about marketing and cover design than my publishers did… but I do really miss my editor”. Looking ahead, concluded Tom, what can writers do, practically, to carve out a path in an increasingly fractured industry? “The future for writers is all about being flexible,” said Tammy. “It’s not about having the same publisher for life anymore. Consider being a hybrid, and mixing traditional publishing with independent”. Laxmi advised new authors to write an entire five-book series and then self-publish the novels, one at a time, around a month apart. “That way,” she reflected, “at least you’ll have momentum”.